What should I expect from my traction control and anti-lock brakes? I'm a pretty good winter driver, but I feel like I don't have the level of control I would hope for,and I feel like my brakes lock up when they shouldn't. I'm not sure what your expectation is for the traction control (TC) and ABS systems. If you're thinking it's going to be like AWD, you'll probably be disappointed. In general, TC limits the slip of the drive wheels (front on the Corolla) during take-off and acceleration by electronically limiting the engine power/torque to those wheels. It does not provide traction that was never there due to ice or other slippery conditions. Similarly, ABS will prevent individual wheels from locking up due to lack of traction during braking but cannot perform magic if the conditions are such that very little traction/friction is available (such as on ice). The ABS will start to engage as soon as one or more wheels start to lock up. If you happen to be on ice or other very slippery surface, all the wheels may be slipping and the ABS will have the effect of locking/unlocking each wheel repeatedly which will make it seem like all the wheels are locked and sliding (which they are for all intents and purposes). As drivers in very cold snowy climates will tell you, the only real solution for ice is studs or chains but these solutions can make dry road driving more dangerous (or impossible in the case of some chains). At the very least, winter-specific tires are ideal for these conditions, but not so great on pavement which is dry or just wet. One major factor in all of this is your tires. Modern all-season tires are, at best, a compromise and they vary widely in quality and performance (especially in snow/ice). 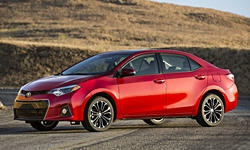 Unfortunately, Toyota has a history of putting relatively low cost/low performance all-season tires on Corollas. So, if you have a tire with poor wet/snow/ice grip to start with, it will have the effect of reducing the performance of the TC and ABS dramatically. In fact, with very poor tires, the TC and ABS will both engage much sooner and more suddenly than they would with a better tire. The OE tires on our daughter's 2009 Corolla (with the TC/ABS option) were so poor for both wet and dry traction that we replaced them almost immediately when the car was new with higher quality/performance all-season tires. Hope all of this helps explain what may be going on. As I said above, a new set of good all-season tires might solve most of your concerns if they're in your budget. As my name shows, I used to own Toyotas and Hondas. I stopped driving them mostly because they are both terrible in the snow. I owned a Corolla and a Accord and neither with snow tires could get up a 650 mountain to my home, so unless the road was plowed, I had to walk up the mountain which was about a mile to my house. When those cars wore out I replaced them with a Subaru (2013) and Saab (2006). The traction control on the GM built Saab works a lot better than the Japanese cars so it can get up the mountain, and the Subaru because of full-time AWD works even better. The Japanese cars Traction Controls work but in heavy snow they seem to not be able to do it (they fail and stop working with warning on the dashboard). 2016 LE here. Within reason (it's not AWD/4WD), we've had zero problems in snow/ice with 6K miles on 16" OEM Toyo tires. What model are you driving? 16" or 17" tires? Summer or all-weather tires? How many miles on them? What's the tread depth? Without knowing that, can't answer your question.